A Clavinova offering outstanding performance and versatility with innovative features to enhance musical creativity and enjoyment. Real Grand Expression: sound, touch and pedals, all perfectly integrated to give you the sensation of playing a grand piano. The CFX, Yamaha’s finest concert grand selected and played by the winner of the 2010 International Chopin Piano Competition and the Imperial from Bösendorfer, a brand held in high esteem by pianists throughout its long history. These renowned pianos are characterised by distinctive traits such as power, versatility, subtlety, lightness and mellowness. Both of these superb pianos' Voices are featured in the Clavinova. Tuned to perfection by a highly experienced piano technician with the sound from each key sampled individually, Clavinova truly captures the unique tonal character of each of these outstanding instruments. With Clavinova, you can enjoy the exquisite beauty of the sought-after tone that the CFX and Bösendorfer Imperial deliver. The Clavinova faithfully recreates the sound of an acoustic piano by utilising features such as String Resonance to emulate the mellow tonal colours that occur when strings react to one another. The result is a beautiful tone with rich, deep reverberation. Featuring Yamaha's Smooth Release technology, Clavinova recreates the crisp tone heard when playing staccato as well as the lingering sound produced by releasing the keys slowly. 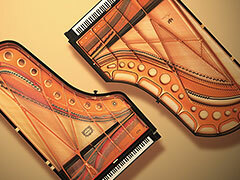 The moment a pianist’s fingers are lifted from the keys of a grand piano, subtle changes occur in the instrument’s tone as the damper is lowered onto the strings to mute the sound. Key-off samples feature actual recordings of these changes, offering a faithful reproduction of the most subtle nuances in the piano’s tone, creating a more realistic overall sound. Natural Wood X (NWX) keyboards are created using Yamaha's unrivalled expertise of wood acquired through more than a century of crafting fine pianos. Just as with grand pianos, the material used for NWX keyboards is cut from wood that has been carefully dried specifically for use in making musical instruments. Utilizing the same hammering system and spring-less mechanism as a grand piano, NWX keyboard action reproduces the touch of an acoustic piano from the heavy feel in the lower register to the lighter touch in the upper octaves. And the three-sensor configuration accurately senses and interprets the behaviour of the keyboard for a response and feels very similar to that of a grand piano. The NWX keyboards also feature an escapement mechanism that reproduces a slight clicking sensation near the bottom of the key travel, and they have been designed in such a way that the click is discernible only on the lightest keystrokes, similar to the keyboard of a grand piano. 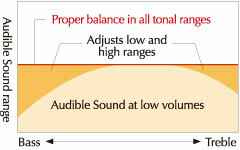 Dedicated drivers for mid and high frequency ranges provide astonishingly powerful an detailed sound. 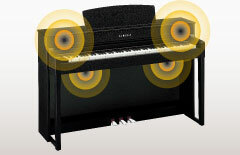 The body of the Clavinova contains Acoustic Optimizers that regulate the flow of sound and control tone. 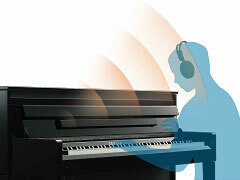 A new technology developed from Yamaha's intimate knowledge of the acoustic properties of musical instruments, Acoustic Optimizers deliver a natural, smooth sound across the entire keyboard. Features exercises for building piano technique from Hanon, Bayer, Czerny and Burgmüller. Enjoy performing with rhythms such as jazz, pop, latin and more. The recording function featured in Clavinova digital pianos allows you to record your performances with a single touch, which is useful when you want to review or archive your playing. You can record up to 16 tracks for simultaneous playback, so that each hand can be recorded separately or parts recorded using different sounds. Record performances to USB flash memory and create audio files (WAV format) you can save and play back on a computer or portable audio device, share with friends or use to create a CD. A new reverb system allows to you experience the sensation of playing in a large concert hall, cathedral or other venue, adding depth and atmosphere to the sound. Now you can experience concert hall ambience and spaciousness in the privacy of your own home. Headphones Hanger, "50 greats for the Piano"
Buy with confidence online & mail order. Buy it. Try it. If you don't like it return it to us with in 7 days in its original condition & we will give you a full refund excluding postage charges. Returned goods must be in their original condition and packaging. If you decide that you do not wish to keep an item you can either return it to us yourself at your own expense, or contact us and we will arrange collection which is chargeable. The average cost for a collection is £14.95. This returns policy does not apply to any items that have been especially ordered. All returns MUST be confirmed by email or phone in order to get a returns number.